There are different kinds of parties you can go to: the overly formal, generally family-oriented parties held to commemorate a special occasion, orstreet parties, which mostly take place in small villages to celebrate a religious event. There are also completely informal parties, made up of friends and buddies that you can attend even if you haven’t been invited; and of course there are those that started out as a gathering of friends but turned into a party and ended up in complete debauchery. It seems that the party, before the hangover, presented by curator Sol Henaro has more in common with the last kind than any other: a kind of grouping of people sharing the same interests who began creating a scene in common, not just with regard to their art work but as a community in which they literally shared the party, disillusionment over a country permanently in crisis, the need to find new developments in art and define them in a new form of discussion reaching beyond academia. It was a new way of life that simultaneously changed Mexico’s art field and the art practices that make it up. The exhibition Antes de la Resaca: unafracción de los noventa en la colección del MUAC (Before the Hangover: a Fraction of the Nineties in the MUAC Collection) looks at a selection of works by artists who began working at the end of the eighties but developed their conceptual and aesthetic approaches in the nineties, in what were once called alternative spaces but now, following a conceptual adjustment, are known as "independent spaces". In fact the exhibition shows a few artworks that, in the curator’s opinion, are the most representative spaces of the nineties: La Quiñonera, Temistocles 44 and La Panadería, which trace a genealogy of such spaces in accordance with their appearance and, of course, chronicle their perfected institutionalization. La Quiñonera sprang up in 1988 as a place for meetings and occasional shows in which some artists had their workshops, the movement evolved, in 1993, to a more active place for discussion in which proposals were adopted following a more closed, consensus-reaching basis in Temistocles 44, until that group broke up and some of its members were invited by Miguel Calderón and YoshuaOkon to La Panadería in 1994, with a much more carefree profile in which discussion over the selection of works was important but had more to do with generating exhibition and group dynamics in relation to a lifestyle: parties and exchanges - making art fun. As its title states, the exhibition shows a fraction of the pieces in the MUAC collection and associated collections. It is not an exhaustive show (it does not include all the artists who took part in that decade, almost none have more than one piece on display and no attempt is made to document all the processes that influenced the reorganization of the art field), but it does seek to display some of the key pieces that reflect the different aesthetic and theoretical-discursive interests of local production in Mexico City in the nineties. Among others, Eduardo Abaroa’s El obelisco roto para mercados ambulantes (1992), Vicente Razo’s El Museo Salinas (1996), the SEMEFO group’s Mineralización Estéril (1997) and Rubén Ortíz-Torres’ Rompiendo el Código Maya (1995) are on display; no paintings (an art medium that was traditionally Mexico’s most representative) are featured, and what predominates are art objects, videos, installations and drawings. 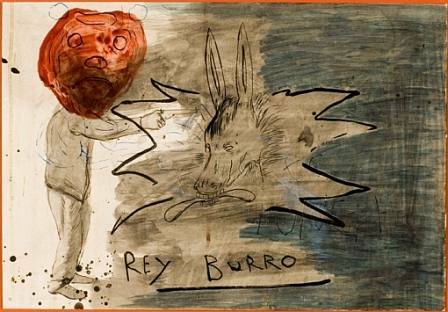 Moreover, all the artworks show an interest in context and in the impact that other social fields can have on the art world, while distancing themselves from the tradition of a Mexican art that emphasized the notion of identity and of being different. Furthermore, the exhibition shows how all these artists felt that the notion of national identity (which was promoted by the State until the mid-nineties) was in crisis by consciously distancing themselves from the historic representations of Mexico through art, which always had a sense of grandiloquence and sought to link all Mexican history with a marvelous mythical past. Apart from the artwork on display, several other elements help to place the exhibition in context and show that the pieces alone were not enough to mark the shift in the Mexican art field: the magazines CURARE Espacio Crítico Para las Artes and Poliésterpintura y no pintura (perhaps Mexico’s first magazines to specialize in contemporary art) were included, along with the four issues of Alegría published by the Temistocles 44 group, Daniel Guzmán, Luis Felipe Ortega, Damián Ortega and Gabriel Kuri’s Casper magazine, and Rogelio Villareal’s La Pus Moderna. The show also features a jukebox with selections of the music of the period (Los Caifanes, Santa Sabina and La MalditaVecindad, among others), in addition to a radio cabin that broadcasts from one of the rooms anda video showing the workscreated in situ at the house on Temistocles 44. The exhibition will also feature a series of talks and dialogues with artists, critics and curators that place it in context, while discussing topics such as the appearance of such art forms in relation to institutional spaces, the changes in the country’s economic policies and, of course, the circulation of these works in different circuits and how the discourses that validate them and their symbolic value were shaped. In short, the talks will focus on the shift in art production towards what can be called "contemporary art".